Eero Saarinen was an architectural genius. This is generally an accepted fact and one that I have never had reason to dispute. Passing by the TWA terminal he designed has always been one of my great pleasures in flying out of JetBlue‘s T5 facility at JFK Airport. But those interactions were always fleeting, leaving little time to admire the facility and never permitting access inside to truly get a feel for what it is like and just how amazing it is. That changed this past weekend thanks to the folks at Open House New York and the Port Authority of New York and New Jersey. 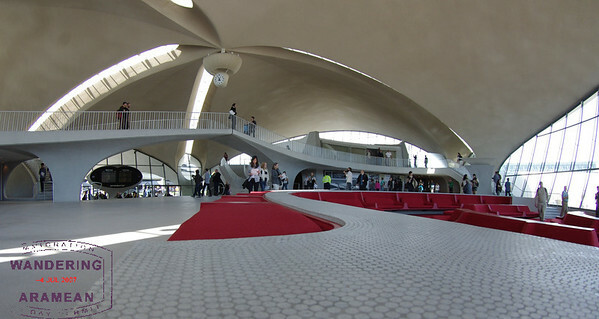 For a few hours on a beautiful, clear Sunday afternoon the Saarinen terminal at JFK (officially named the Trans World Airline Flight Center at John F. Kennedy Airport) was opened to the public. I was one of several hundred aviation, architecture and history buffs who made the trek out to the airport to explore the terminal and bask in its glory. The sunken seating area in the main section of the terminal. 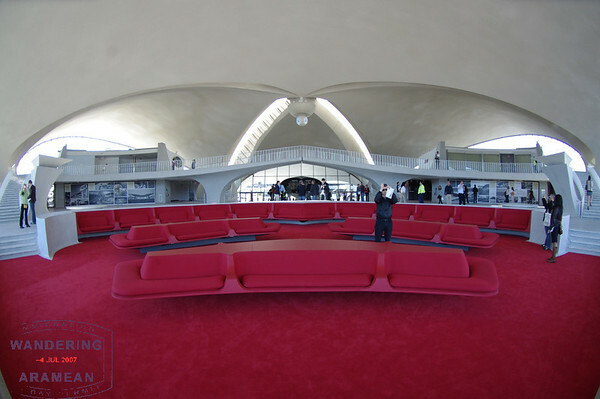 Saarinen, who also was the architect behind the incredibly utilitarian Dulles International Airport outside Washington, DC, never got to see the TWA terminal completed. He died in late 1961, several months before the facility opened in May of 1962. Almost immediately after it opened the terminal was recognized as being too small to serve the passenger loads it was seeing. 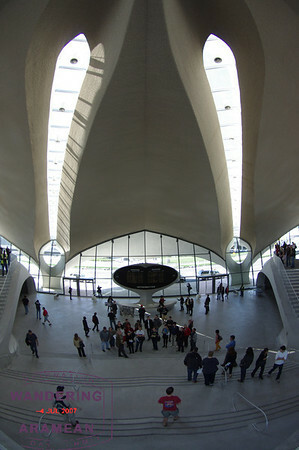 Additional space was added on outside the main lobby and lounge area and a second "people tube" was built arching over the roadway to the end houses where passengers boarded their airplanes and embarked on their journeys. But the beauty was in the Flight Center building. That beauty still very much exists today. The curves in the building are incredible. 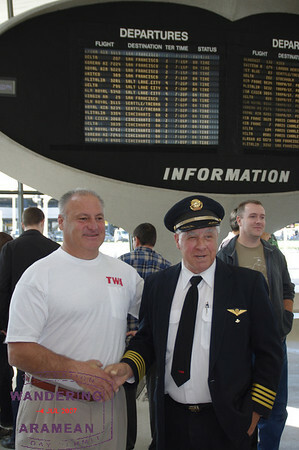 A number of former TWA employees were on hand as well, drawn to the history of the building just like the rest of us. One pilot, Richard Siano, arrived in his full uniform. Siano chatted with anyone and everyone asking about his history with the airline and the operations of the facility. He also was able to recount some of his fondest memories, including showing up to work one day in January 1964 with barely more that 1000 hours of flying experience and no multi-engine rating. He was placed in the right seat of a Constellation and after 500 hours as a First Officer he was made Captain. A couple years later the Connies were retired as TWA became the first major carrier to be all-Jet and he was flying as a Captain on the 727s. Towards the end of his career he would often commute from his home in Western New Jersey to JFK in his private Piper Cub and then switch over to a 747 to fly around the world. Lenny (left) and Captain Richard Siaro catching up on old times at the event. There was also Lenny, a driver for the carrier, and Tom who worked maintenance for them up until the assets were purchased by American Airlines. A number of JetBlue pilots and other crewmembers who showed up to pay their respects to the previous generation of aviators and I had a great chat with a pilot from Continental who had come for similar reasons. The tiny, round tiles are everywhere, and they are amazing. There were a couple officials at the event as well. One was Jim Steven, the Manager of JFK’s Physical Plant and Redevelopment for the PANYNJ and to talk about both the future and the history of the building. In addition to gushing that he "has the absolute best job in the world for a civil engineer," Steven was quite excited by the renovation efforts that were completed thus far and even more so about the future redevelopment efforts in store for the building. The Port Authority is in discussions with a couple hotel developers to repurpose the facility in a "completely outside the box" manner in the coming years. Seeing the building potentially being placed back into use is an incredible development. The departures board has been updated to tie in to the current JFK schedule, but the architecture is 100% original. Charles Kramer, the architect leading the restoration efforts from Beyer Blinder Belle Architects & Planners was also on hand talking about the history of the building as well as the challenges faced in the renovations. In many cases the challenges were literally the little things, such as the half-inch round tiles that cover many of the surfaces. These tiles were impossible to source new as no one makes them that size any more. The roughly two million tiles needed in various areas were contracted out to be produced from scratch. The non-slip skids on the stair nosing was similarly unique to the building and was more or less destroyed in the last years of the Terminal’s functional life, eventually covered with a rubberized sheet to meet the functional, though hardly the aesthetic, needs of the building. These, too, were rebuilt and restored to their original designs. 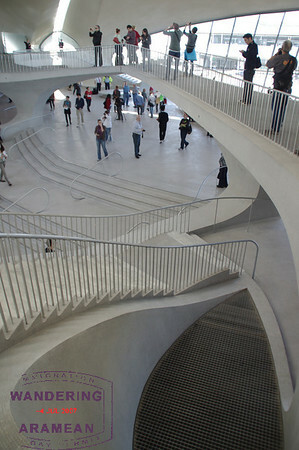 The striations in the concrete are form the individual boards used to shape the forms from which it was originally cast. There was also much discussion of the original construction process. Each side of the structure was produced as a single pour of concrete which took roughly 30 hours start to finish. This pour was made over significant amounts of re-bar and into enormous, custom-built wood forms to create the shape seen today. If you get up close to the facility you can actually see the markings from the original wood forms still on the underside of the concrete faces. It is simply amazing the amount of detail that went into the construction effort. Inside the original "People Tube" connecting the Flight Center to the gate area across the way. Faced with the impending renovations of Delta‘s facilities at JFK, including the Pan Am Worldport (now known as Terminal 3) there was some discussion about whether that, too, would be maintained given its historical significance. The answer was a rather frank and un apologetic "no." Essentially the Port Authority had to pick one building that would be kept on as a historical landmark and homage to the previous era of aviation and the TWA Flight Center is that choice. I certainly can understand why. 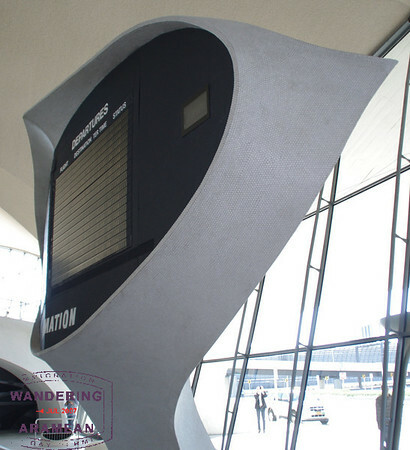 Don’t get me wrong – the Pan Am Worldport has plenty of history as well – but it has nothing on the TWA Flight Center as an icon of aviation. I’m very much looking forward to when the building is fully renovated and developed so I can have a new hang out at the airport, even if that is a few years down the line. Really great photos (especially the “tile” one) …. Many people put a lot of effort into the current restoration …. if you think its nice now, wait till we finish! I’m looking forward to many future visits, Jim. Thanks so much for opening up the building and showing off all your hard work. It is most definitely appreciated. Glad everyone is enjoying the photos. 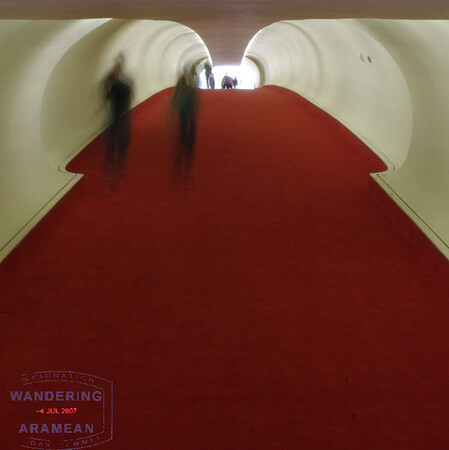 I very much enjoyed your thorough article and review of the TWA Flight Center @ JFK. I was there as well but my pics aren’t even worth looking at after seeing yours. Thank you for sharing your experience! I’m David’s mother. He was so excited about seeing the TWA flight Center as he’s a real airplane buff and he had a great visit. Thanks for your wonderful photos and great commentary. I hope I can see the terminal one day. I remember flying from it many times. What a great way to spend the day. Thanks for sharing your awesome photos! I wanted to check out the TWA Center yesterday but couldn’t make it. Thanks for sharing your pics with us! As a TWA pilot, I fondly remember working out of this beautiful building. I wish they would have been able to include a photo of the bird-like (Eagle?) 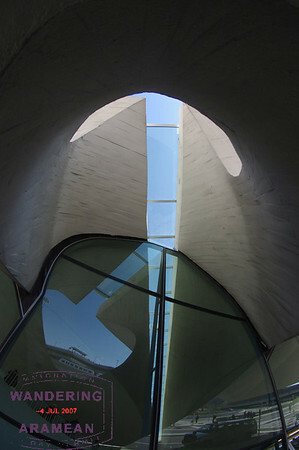 quality of the external shape of the structure. It truly is a work of art. I flew for TWA from 1989 to 2001 when AA purchased TWA. I was a pilot flying L-1011s out of this terminal to Europe and the Middle East. I’ll cherish those memories always. Try this one on for size, Jeff: http://gallery.millerworks.net/Travel/Inside-the-TWA-Flight-Center/19573386_G7bM4K#1535599462_HX9Dvtg-A-LB. Dunno why I didn’t upload that one the first time around. 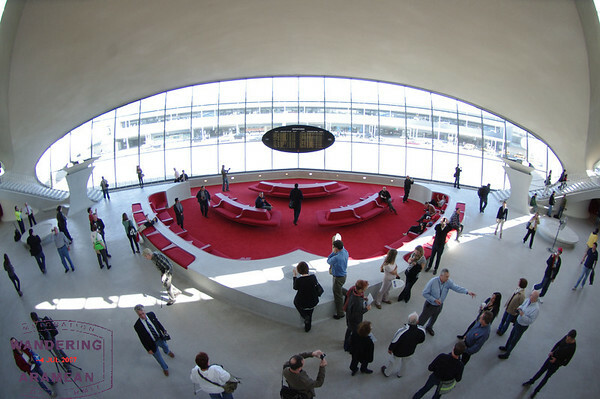 There are a bunch more photos here: http://gallery.millerworks.net/Travel/Inside-the-TWA-Flight-Center/19573386_G7bM4K. Great photos and comments! Brings back many great memories from my 1966 to 1992 Pilot career with TWA! I was NY based for 6 yrs and flew from this terminal numerous times. I wish I had heard about this earlier! I would have loved to come up and view the terminal; I love the 60s architecture. I was there for the groundbreaking. TWA had moved from its area near gates 8/9 in the temporary terminal to the area recently vacated by Eastern near gates 14/21, refered to then as the “hook area”. We upgraded and utilized Easterns counter and hold room. The Flight Center was built just to the left of that area facing the roadway. The tin sheep runs were upgraded and referred to as “urban renewal” while the Flight Center was abuilding. When the gates in Flight Wing 2 became operational we would guide the passengers from the hold room in the temporary terminal through the unclompleted terminal in the Flight Center and out the “tube” to gates 8 through 15. When the Flight Center was complete the old areas, including “urban renewal” were razed. After the last flights of the day the jetways had to be extended to their full length to expedite cleaning. There were often “Jetway” races with an agent in the front jetway racing the agent in the rear jetway to see who could get to the fully extended limit first. The jolt when the limit switch was hit at full speed was quite jarring. Thanks for sharing the great pictures. Brings back many fond memories. Wish I could have been there.